Simply Groups will be joining the Belgian National Tourist Office on their extended stand representing Brussels and the Belgian Ardennes at this NEW Travel Show. As the preferred tour operator for all packages to Brussels & Wallonia, Simply Groups along with partners from Belgium will be promoting a selection of exciting itineraries to suit all group tastes. This show is to be held at the Copper Box Arena at the Queen Elizabeth Olympic Park in London on Saturday 16th January 2016 from 10.30am-4pm. Simply Groups are pleased to announce their participation at 'The Premier One Day Group Travel Exhibition'. This is to be held at Alexandra Palace in London on Saturday 23rd January 2016 10.30am - 4pm. Visit our stand F28 to see out NEW selection of group holiday destinations, learn about our upcoming & exciting Group Organiser Familiarisation tours or just to have a chat and intrduce yourself to the team who will be present. Simply Groups would like to congratulate two of our ‘long-standing’ Group Organisers, Angie Harris & Shirley Ward, for being awarded the British Empire Medal in the Queen’s Birthday Honours list 2015, for their services to local charities. Well done ladies – you both completely deserve this recognition. We hope you both have a wonderful time at Queen’s Garden Party as we know how you enjoy a glass of bubbly!! Celebrating the 2nd big birthday of the year within the SG’s team. We will be exhibiting at Excursions 2015, come and visit us there! This Premier One Day Group Travel Exhibition will be held on 24 January 2015, 10am-4pm at Alexandra Palace, London. The April/May 2014 edition of the Group Travel Organiser Magazine includes editorial of the recent Simply Groups Familiarisation visit to Jersey supported by Jersey Tourism and Condor Ferries. Group Leisure, a well-known travel industry name, have just released their nomination form for the 2014 ‘Excellence Award’. If you think that one of the team members at Simply Groups deserves to be put forward for this award and if you feel so inclined, would you please take a few minutes to complete the short nomination form by clicking on the ‘Nominate’ button below. We know that the majority of our clients are extremely pleased with the service that we provide and this would be an opportunity for the services offered by one of our team members to be recognised, albeit that everyone at Simply Groups works equally hard to ensure that our tours run smoothly. Joanne Wood, Kathryn Latta, Sue Harris, Clare Lowans or Joyce Spencer. Group Leisure 2014 Excellence Award, please click here to Nominate. Yet another successful year as Simply Groups celebrates our 13th anniversary in the group travel market. With even more satisfied customers than before, our bespoke group holidays are not only excellent value for money but our tailor-made arrangements ensure that all goes smoothly throughout all stages of the tour planning. We look forward to bringing you more news as the year progresses. 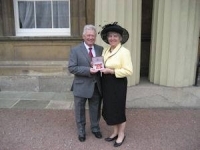 Congratulations to Mrs Sue Smith, Former Chairman of the Townswomen's Guilds who received her OBE from the Queen at ceremony at Buckingham Palace on Friday 28th March 2014, in recognition for services to the Townswomen's Guilds. Over the last 10 years we have worked closely with Sue, arranging very successful annual group holidays for the Townswomen’s Guild. 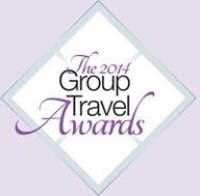 Simply Groups has been voted by the readers of the Group Travel Organiser magazine as a finalist in the 2014 Group Travel Awards category of Best Tour Operator for Groups – Short Haul. Simply Groups are pleased to announce our attendance at the Tourism & Attractions Show to be held in Ironbridge, Shropshire. This is the ‘Regional Showcase for Shropshire, Staffordshire, Cheshire, The Midlands and North & Mid Wales’. The Tourism & Attractions Show 2014 is a great day for group travel organisers to gain inspiration for places to visit and things to do with their groups in the future. Visit our stand to discuss your group tour requirements and see how we can be of assistance in operating a successful tailor-made group holiday. The venue, Enginuity, is a hands-on museum exploring the technology behind industry and is one of the 10 museums that are located within the UNESCO World Heritage Site at the Ironbridge Gorge. The Gorge, formed by the Severn river is spectacular in itself, while each museum celebrates different aspects of the Industrial Revolution. Visitors to the show will be able to explore the other museums at Ironbridge after their visit to the exhibition and will also have a ticket to revisit the site at a later date. This will include the chance to visit the renowned Blists Hill Victorian Town, a recreation of an East Shropshire mining town in around 1900. Simply Groups are pleased to advise our attendance at the TRAVEL & TOURISM SHOW, the ONLY Group Travel Show in the East of England. Now in its 19th year, the Tourism & Leisure Show will once again be taking place at the Crowne Plaza Colchester Five Lakes on Thursday 20th February 2014. The show is set to be another bumper year, with fantastic ideas for short breaks and great days out throughout the East and South of England. With over 90 exhibitors including, visitor attractions, hotel groups, tour operators and destinations, the Tourism & Leisure Show boasts a wide range of free information for group travel planning. For an up-close and personal view, visitors can also listen to presentations from various attractions and destinations, whilst the popular Taste Essex area will be open for tastings and shopping! This show will assist you in preparing your 2014 and beyond group activities and outings, all under one roof, saving you time and energy! For FREE tickets contact 01245 437087 or just come along on the day! Visit the Simply Groups stand at Excursions 2014 where we will have a variety of new and exciting group tours available, as well as upcoming Group Organiser's Familiarisation Tours. For any tours which confirm as a result of an initial enquiry at Excursions 2014, Simply Groups will contribute £100 to the Group Organiser towards gratuities or ancillary holiday costs for use during their group holiday. Group Tour must be confirmed by the 30th September 2014. Applies to new group enquiries only and is at the discretion of Simply Groups. Subject to a minimum group size of 30 persons and is available for each tour confirmed. Payment will be made by cheque 2 weeks before the tour departure date. If the tour were to be cancelled the payment would be negated. The 'Tour de France' in 2014 comes to Yorkshire for 2 days in July. We are pleased to advise that we are able to offer a limited number of group packages to coincide with the Tour de France stages. Our packages can be written specifically based on this race or we can also include a selection of visits, making this more than just a bike race.